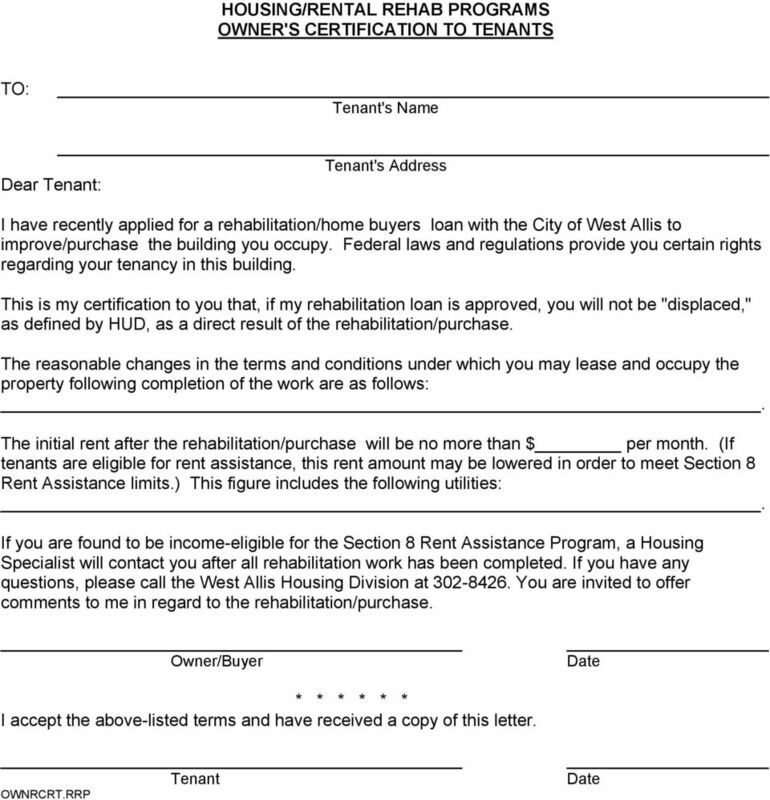 Download "City of West Allis Rental Rehabilitation Loan Program"
3 CITY OF WEST ALLIS RENTAL REHABILITATION PROGRAM You must meet the following terms and conditions in order to qualify for a Rental Rehabilitation Loan from the City of West Allis Housing Division: 1. Property must be a rental property not occupied by the owner. 2. Applicant must be the owner as registered with the Milwaukee County Register of Deeds Office. 3. Tenants must be within the income limits, and rent must be at or below current fair market rents as set by the City of West Allis Housing Division. 4. The Housing Division will assume that all housing built before January 1, 1978 contains lead-based paint. The owner will agree to correct all lead based paint hazards, according to program regulations, in these properties. 5. Applicants may opt to hire certified contractors to perform paint testing and risk assessment. Results must be given to the Housing Division before a property will be considered exempt from lead based paint regulations. The cost of paint testing and risk assessment can be added to the applicant s loan. 6. In most cases, work that disturbs painted surfaces must be completed by a lead certified contractor. This work will also have to pass lead clearance testing. 7. Owner will be responsible for notifying tenants of any lead-based paint hazard reduction work to take place. 8. Applicant must pay for title search, lien recording and credit check. These charges are added to the loan (Total $80.00 to $330.00). 9. 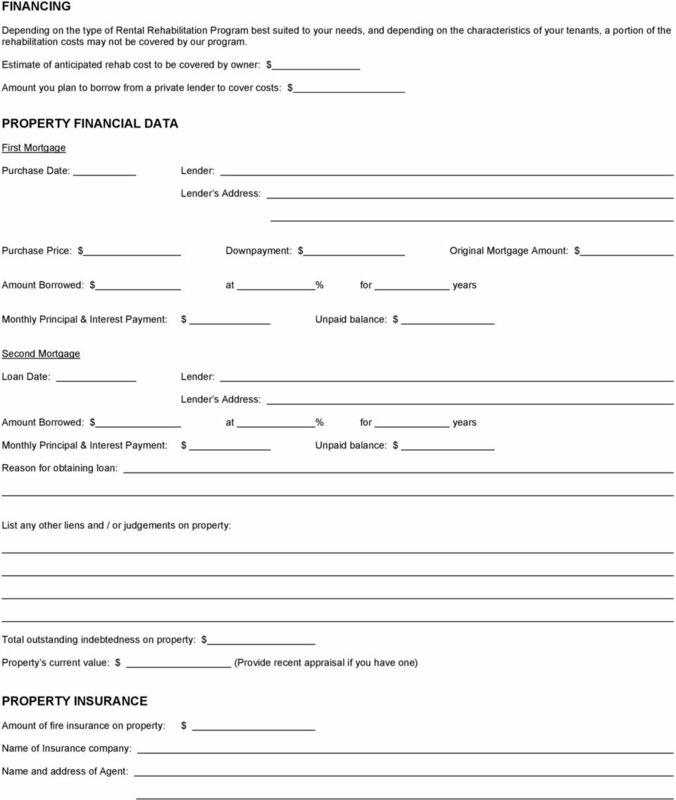 Applicant must sign a lien and promissory note on the property. If house was purchased on a Land contract, the vendor must also sign the loan papers. 10. Eligible repairs include code violations or incipient violations, weatherization work, or repairs necessary for the safety and welfare of the occupants. 11. Loan requests can not exceed $14, per unit. The applicant must have the ability to make minimum payment of $30.00 per month. 12. If applicant is delinquent on any present mortgages, or real estate taxes, the loan will not be approved. 13. 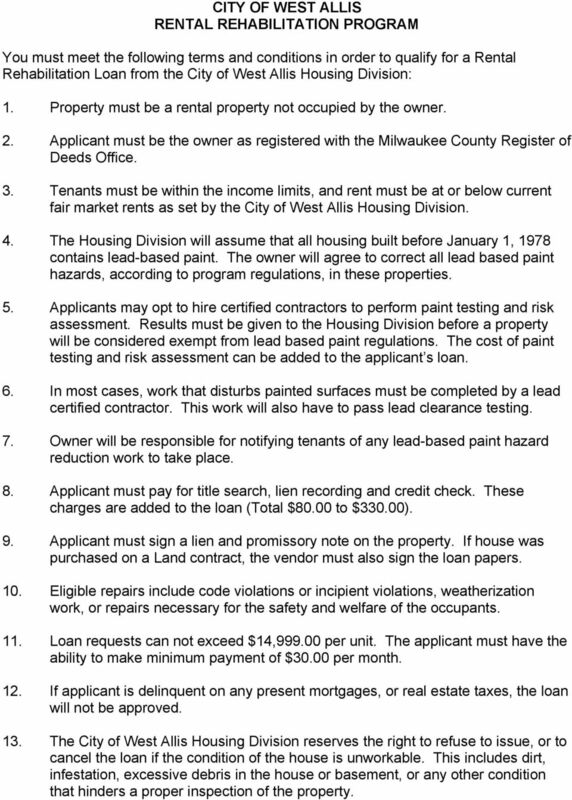 The City of West Allis Housing Division reserves the right to refuse to issue, or to cancel the loan if the condition of the house is unworkable. This includes dirt, infestation, excessive debris in the house or basement, or any other condition that hinders a proper inspection of the property. 4 14. Applicant must make the property accessible to the City of West Allis Housing Inspector, Building Inspectors, Health Department Personnel and to all contractors and workmen. 15. Upon completion of construction, the applicant agrees not to unreasonably or arbitrarily withhold his or her signature of approval. If such approval is withheld unreasonably or arbitrarily, the City of West Allis Housing Division will pay the contractor upon the approval of the inspector. Such paid bill will then be a debt of the applicant. 16. The City of West Allis Housing Division does not subordinate its loan position. If you are planning on refinancing your mortgage, do it before you apply for this loan. 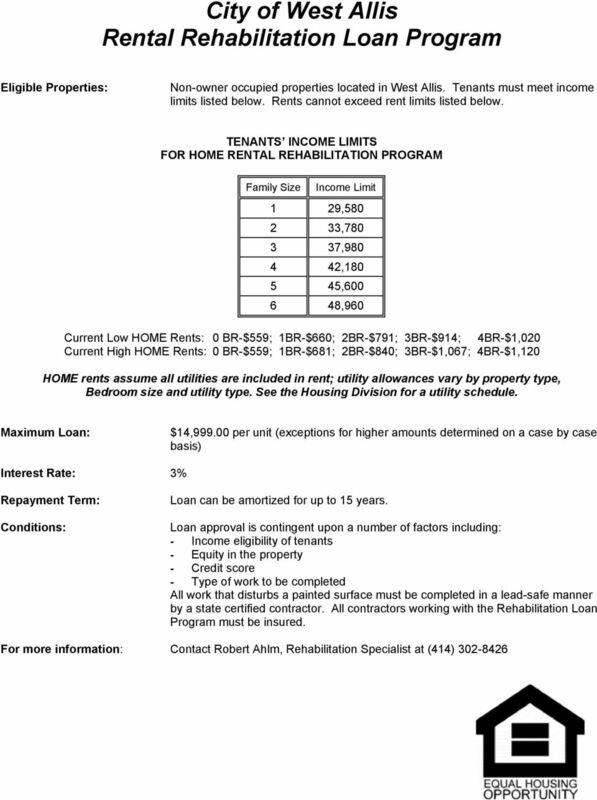 5 CITY OF WEST ALLIS RENTAL REHABILITATION PROGRAM APPLICATION Date The information collected below will be used to determine whether you qualify as a borrower under our Rental Rehabilitation Program. None of this information will be disclosed outside the City of West Allis Housing Division without your consent. You do not have to provide the information, but not doing so may cause your application for a loan to be delayed or rejected. 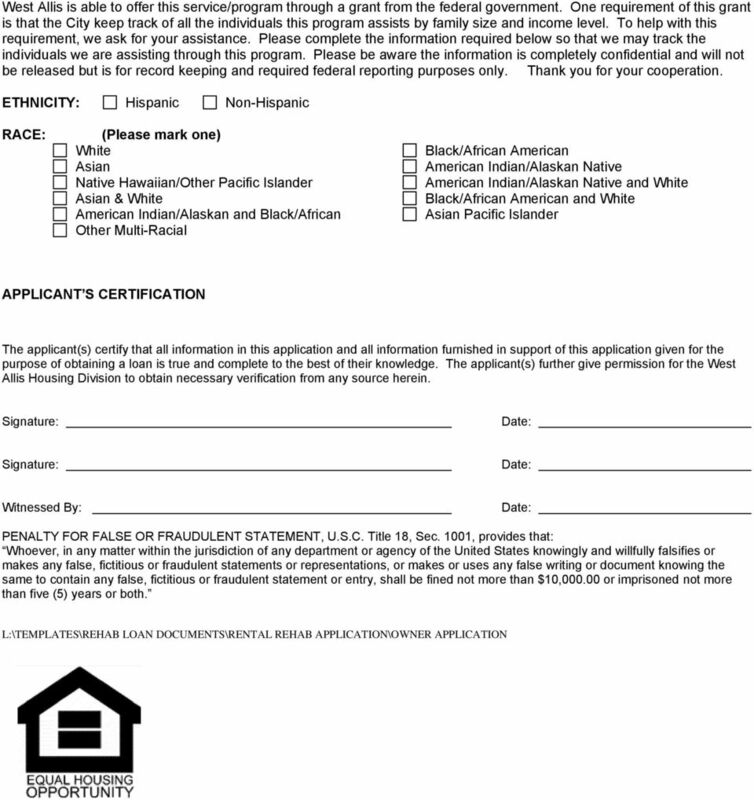 APPLICANT INFORMATION Name Home Phone (Last) (First) (MI) Address City State Zip Employer Name and Address WI Driver License Number Work Phone Are you a minority? (If yes, indicate status) Date of Birth Social Security No. Are you a Citizen of the United States? Yes No If No, Explain CO-APPLICANT INFORMATION Name Home Phone (Last) (First) (MI) Address City State Zip Employer Name and Address WI Driver License Number Work Phone Are you a minority? (If yes, indicate status) Date of Birth Social Security No. Are you a Citizen of the United States? Yes No If No, Explain BUILDING INFORMATION Property to be rehabilitated Number of buildings in project Number of units Number of stories Approximate age Is the building, any unit in the building, or any tenant now subsidized or assisted under any Federal or local housing program, or was any assistance received in the past five years? If yes, identify the Federal or local housing programs. 6 RENTAL UNIT INFORMATION UNIT NO. NO. OF BEDROOMS OCCUPIED (YES OR NO) SIZE OF HOUSEHOLD APPROXIMATE INCOME CURRENT RENT PROJECTED RENT AFTER REHAB DOES THIS UNIT NEED REHABILITATION? (YES OR NO) Will the size of any of these units change after rehabilitation? UTILITIES AND APPLIANCES (Check if provided by owner or tenant) UTILITY TYPE (CIRCLE ONE) OWNER PROVIDES TENANT PROVIDES HEAT Gas Electric Other ELECTRICITY WATER / SEWER WATER HEATING Gas Electric Other STOVE Gas Electric Other REFERIGERATOR Do all units have the same utility arrangements? If not explain: Do you expect to relocate any tenants during the rehabilitation period? If so, how many? SCOPE OF REHABILITATION WORK Provide a brief description of the anticipated rehabilitation work. 9 The purpose of this section is to establish a policy for tenants in units assisted by the Home Rental Rehabilitation/Home Buyers Program. The program goals are to preserve and improve the supply of decent, safe and sanitary rental housing stock within the City of West Allis. TENANT ASSISTANCE POLICY Purpose: The purpose of the Tenant Assistance Policy is to minimize the negative effects of the Home Rental Rehabilitation/Home Buyers Program on tenants and to provide information on rights and services available to present and future tenants. Administration of the Tenant Assistance Policy will be handled by the City of West Allis Department of Development, Housing Division. Objectives: A. Displace as few tenants as possible. B. Provide suitable housing to existing tenants occupying units included in the program. C. Treat tenants consistent with Federal, State and local laws. D. Define owner and City responsibilities toward existing tenants. E. Maximize program benefits to the very low-income. Nondiscrimination of Displaced Tenants: No tenant shall be considered displaced if he/she has been offered a decent, safe and sanitary dwelling in the project at an affordable rent. Affordable Rent: Rental housing shall qualify as affordable if the rents are not greater than (1) the Fair Market Rent for comparable units, or (2) a rent that does not exceed 30 percent of the adjusted income of a family at 65 percent of median income for the area, adjusted for the number of bedrooms in the unit. If a unit is found to be affordable, then no displacement has occurred. Tenants whose afterrehabilitation rent is less than 30 percent of their gross family income will never be considered to be displaced. 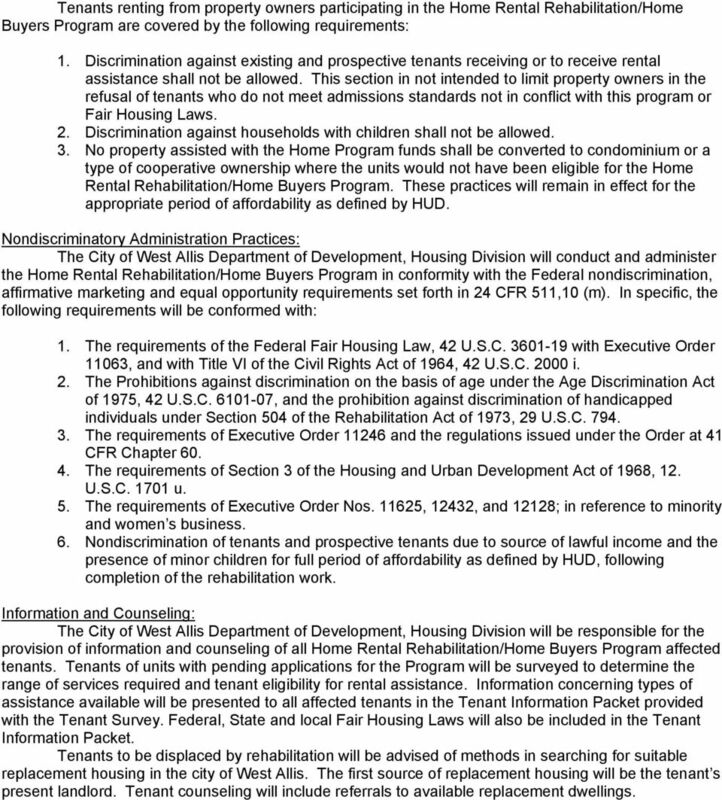 Displacement of low/moderate income tenants by non low-moderate income families shall not occur in Home Rental Rehabilitation/Home Buyer Program assisted units. Displaced lower income families are eligible for vouchers. Very low-income families can only be displaced by other very lowincome families. Tenants who choose to move rather than endure the rehabilitation process will be offered information, referrals, and counseling (see Information and Counseling Section). This assistance shall be available to tenants regardless of their race, gender, age, marital status, sexual orientation, handicap, religion, national origin or lawful source of income. Temporary Displacement: If temporary relocation is required while rehabilitation work is in progress, the tenant shall be reimbursed for all reasonable out-of-pocket expenses by the residential rental property owner, including any increased rent, incurred in connection with the move. The temporary period cannot exceed 90 days. Existing lower income families between 50 percent and 80 percent of Median Income will not be displaced without advisory assistance sufficient to enable the family to obtain decent, safe and sanitary housing at an affordable rent. Very low-income families (less than 50 percent Median) who are displaced or remain will be issued Section 8 Existing Rental Assistance Vouchers. Information concerning vacant units will be made available to tenants. 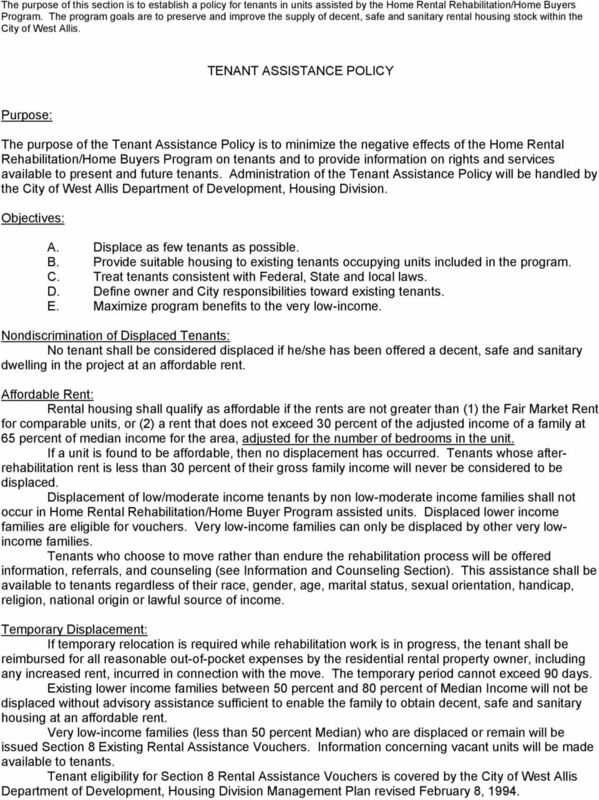 Tenant eligibility for Section 8 Rental Assistance Vouchers is covered by the City of West Allis Department of Development, Housing Division Management Plan revised February 8, 1994. 10 Tenants renting from property owners participating in the Home Rental Rehabilitation/Home Buyers Program are covered by the following requirements: 1. Discrimination against existing and prospective tenants receiving or to receive rental assistance shall not be allowed. This section in not intended to limit property owners in the refusal of tenants who do not meet admissions standards not in conflict with this program or Fair Housing Laws. 2. Discrimination against households with children shall not be allowed. 3. No property assisted with the Home Program funds shall be converted to condominium or a type of cooperative ownership where the units would not have been eligible for the Home Rental Rehabilitation/Home Buyers Program. These practices will remain in effect for the appropriate period of affordability as defined by HUD. 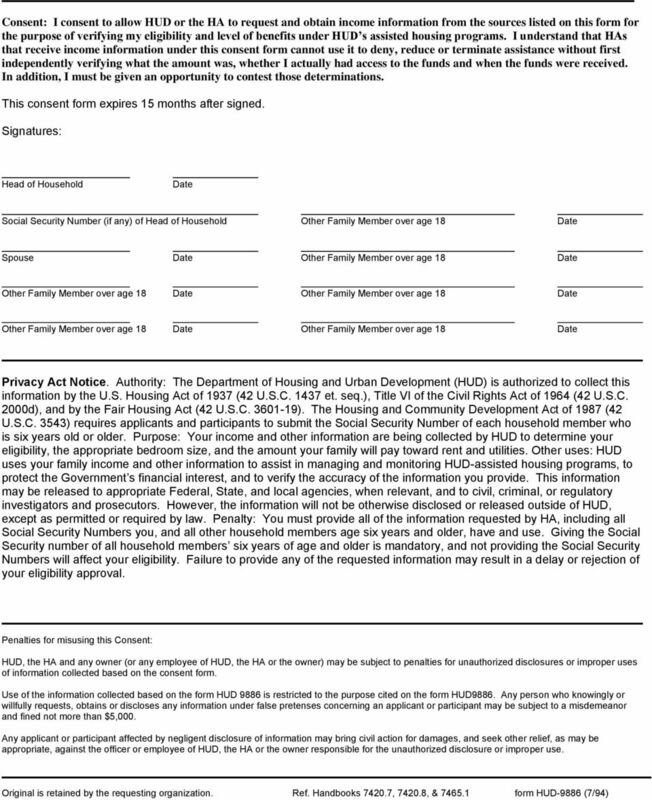 Nondiscriminatory Administration Practices: The City of West Allis Department of Development, Housing Division will conduct and administer the Home Rental Rehabilitation/Home Buyers Program in conformity with the Federal nondiscrimination, affirmative marketing and equal opportunity requirements set forth in 24 CFR 511,10 (m). In specific, the following requirements will be conformed with: 1. The requirements of the Federal Fair Housing Law, 42 U.S.C with Executive Order 11063, and with Title VI of the Civil Rights Act of 1964, 42 U.S.C i. 2. The Prohibitions against discrimination on the basis of age under the Age Discrimination Act of 1975, 42 U.S.C , and the prohibition against discrimination of handicapped individuals under Section 504 of the Rehabilitation Act of 1973, 29 U.S.C The requirements of Executive Order and the regulations issued under the Order at 41 CFR Chapter The requirements of Section 3 of the Housing and Urban Development Act of 1968, 12. U.S.C u. 5. The requirements of Executive Order Nos , 12432, and 12128; in reference to minority and women s business. 6. Nondiscrimination of tenants and prospective tenants due to source of lawful income and the presence of minor children for full period of affordability as defined by HUD, following completion of the rehabilitation work. 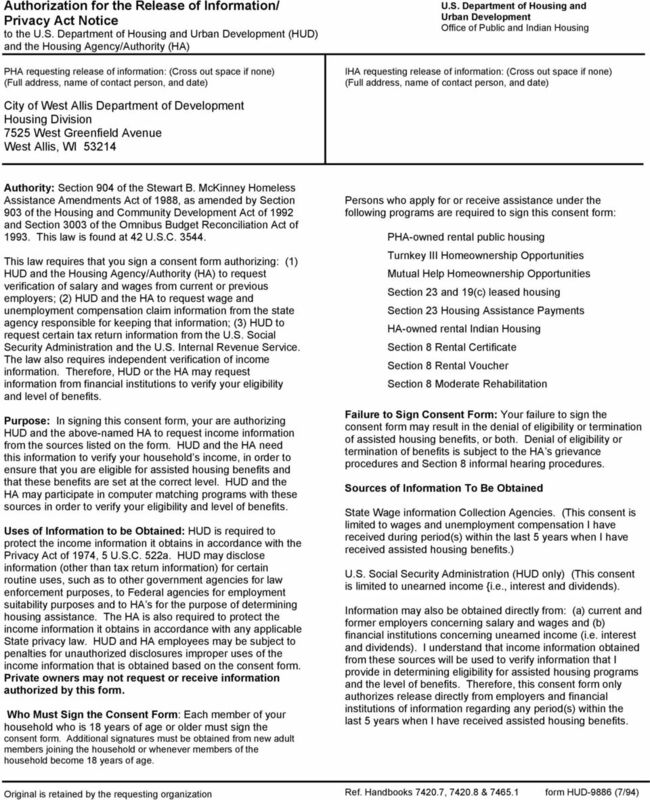 Information and Counseling: The City of West Allis Department of Development, Housing Division will be responsible for the provision of information and counseling of all Home Rental Rehabilitation/Home Buyers Program affected tenants. Tenants of units with pending applications for the Program will be surveyed to determine the range of services required and tenant eligibility for rental assistance. Information concerning types of assistance available will be presented to all affected tenants in the Tenant Information Packet provided with the Tenant Survey. 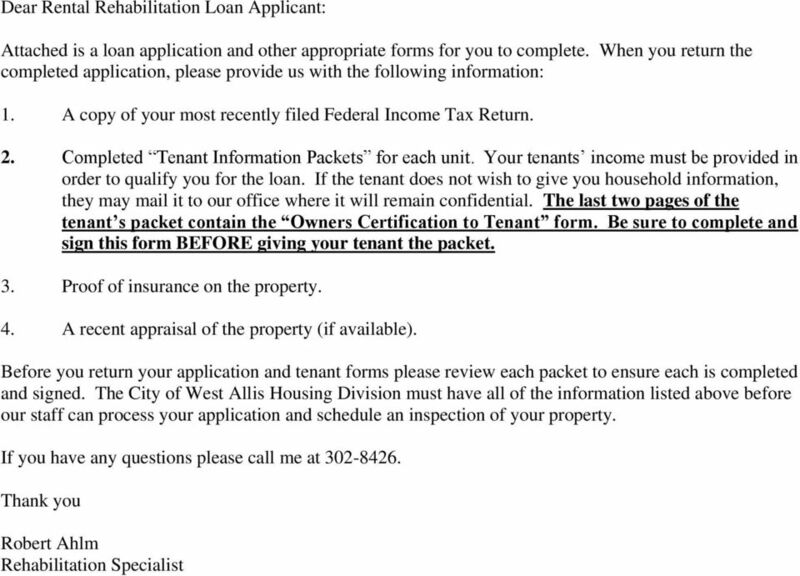 Federal, State and local Fair Housing Laws will also be included in the Tenant Information Packet. Tenants to be displaced by rehabilitation will be advised of methods in searching for suitable replacement housing in the city of West Allis. The first source of replacement housing will be the tenant s present landlord. Tenant counseling will include referrals to available replacement dwellings. 2. Proof of Tribal enrollment for head or spouse. Only one per household is required. APPLICATION FOR ADMISSION TO RIVERWALK PLACE. 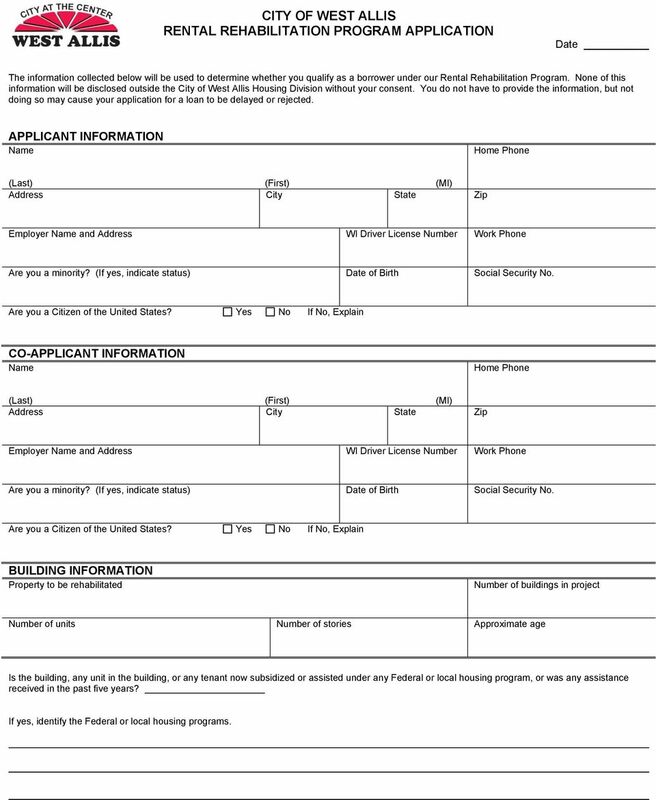 If you need assistance with filling out this application, please contact the office of RiverWalk Place. 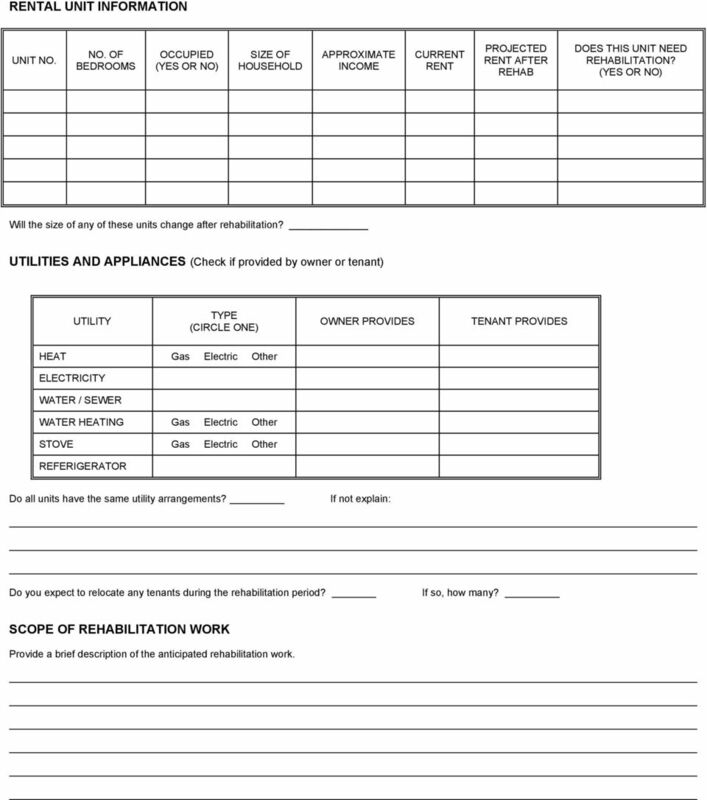 Dear Homeowner, Enclosed are Guidelines and Application for the Middletown Township Home Improvement Program. Is Your Home Lead-Safe. For Your Child? Is Your Home Lead-Safe For Your Child? RENTAL LOAN INFORMATION BRIEF OBJECTIVE The Rental Loan Program objective is not to revitalize neighborhoods, but to assure an adequate supply of standard housing and affordable rents to low income families. Please contact this office at the numbers listed above should you have any questions about the program, its requirements or procedures. A separate application must be completed for each apartment where you are seeking tenancy. See Property List before you fill out this box.